Today my first task as roustabout: I will go shopping for pipe and fittings for the new well at Eldo. Now I'm working for a water well company; we are contributing to the worsening conditions by helping people put in more and bigger/deeper wells. After years of working towards solutions, finally I get to be part of the problem. 2007december1, RAIN! Happy Earmuff Day too. The big words this morning: Rain and Wet and Puddle. Soggy too. The tide has come and gone at The...Inn; you can see the high tide line on the carpets of my work space patio. In the rain gauge: 1.20 inches this morning plus 0.52 from last night. Total more than has accumulated all year. More expected during today. 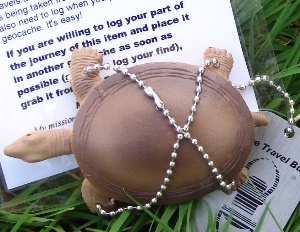 Geocache News: I've released Akita Mani Yo Travel Bug -- Another turtle? You betchya.... I’m a see turtle on a quest. Akita Mani Yo means "Observe Everything as You Walk" and of course return with a storey about what you see. My motto is: If you want to get anywhere you have to stick your neck out. My mission is to visit all the turtle caches between here and Day Pond Cache (GC14KNH) in New Hampshire. I'm hoping to meet with Tunkasila Machkeu Tulpe [TBjj56] before he outgrows his shell. > happened for a whole year again and it has been the longest year yet. For me I think this has been one of the shortest years tho all the days are yet to be counted complete; this has been a year of mixed feelings. Have I done and have I dared every thing to cross my path? Mostly I think. Perhaps. However there are some notable exceptions where I have either pulled in my horns, bit my tongue, or not pushed the envelope quite as hard as I might. It is those places I rue more than I remember the joy of having gone over the edge or around the bend just to see what is there and where is next. > Down from the door where it began. > Where many paths and errands meet. > Until the stars are all alight. > We'll wander back to home and bed. > Away shall fade! Away shall fade! I'm not done yet. Not done in. The Way is clear. The means are the hardest part to find. > (novel, creative) way around it. Yes! Well spoken. Thank you. That is the part I need to work on and prepare my Self for. And the while is most mean and seemingly getting worse. > Merry Christmas if you can, it is around that time and the Music has begun. I'm skipping over that part. Ignoring its over bearing presence. The radio will remain off for the duration except perhaps if I can find a presentation of the Hallelujah Chorus. Notwithstanding the context, the music moves me still and if the presentation is live and I can sing along still a tear will come to my eye. With propane now at 3$50 a gallon life is getting so I cannot survive on my own. Last week I applied for food stamps and other Aid to the Indigent & Elderly. I suppose I should be thankful such aid is available. I've always maintained I don't want to live if living means being tied to life support and it seems to me that food stamps are the first step in the direction of that dependence. At the rate the cost of fuel is going it is likely my next peregrination will be a peregroanation. There is a mentality of self destruction afoot in these disUnited States. I have visions of a Riding Along on The Crest of A Wave segue into Wipe-Out any day now. 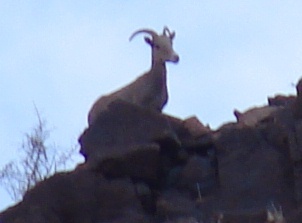 After all these years of running around in the hills out back I finally get to see a Big Horn Sheep! During a hike with the Friends of Saddle Mountain on saturday the leader pointed out a teeny tiny T-shaped cactus-looking object at the top of a ridge waaaay up there. Thanks to my steady hand and the super-pornagraphic lens of this dandy camera, not to mention the kind of digital chicanery they are capable of, I got the best picture. Having a good time out here in the desert south of Ajo. Yesterday Betty took me to town to help with the Needy Kids Present Wrapping Party. Some days wishes do come true. Besides the name: Marcel, age: 8, and other facts of size and gender, the Angel Tag from the Wishing Tree had one word: Bike. A bike for Marcel and six more for other kids had been donated by one man in town. They stood upside down, wrapped in black plastic, amidst piles of presents and bags of boxes, all wrapped and tagged for delivery. Looking like an elf, togged up in tunic and jesters hat, we delivered this boy's wish. 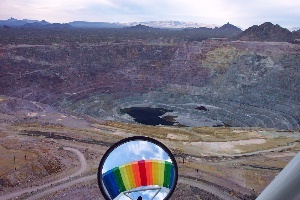 He stood to one side as these things were carried in to the clutter of run down abode where he lived in the off-side of this once prosperous copper mining town, the bike still upside down so it might not look like his wish come true. On my way out the door he asked: Aren't elves supposed to be small? Mostly yes, I answered; I'm a basketball elf. The look on his face was of wonder and astonishment. 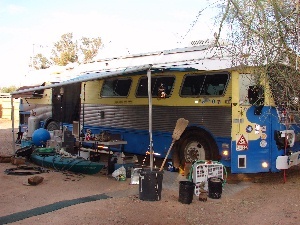 38f here in the desert south of Ajo this morning. Mostly clear at dawn. Perhaps the day will warm sufficiently for a nice walk to a geocache. A Smithsonian Museum travelling exhibit is in residence at The Curley School. Between Fences "tells American storeys through diverse fence types, and in doing so, examines human relationships on an expanding scale..." Depicting the idea that good fences make good neighbors the displays tell the storey of the invasion this once unfenced land by Europeans who were used to the security of pickets and cubicals. Through 20th January and well worth the drive to Ajo. The copper mine built this town. The name, borrowed from the Ajo Lilly which grows in the desert, means garlic in Spanish. The town common is laid out like a hacienda. Three sides bordered by a wall of arches leading into various shops while the west quarter opens onto a view of churches in the Spanish style and a backdrop of Ajo Mountain. On the common the trees stand quiet and dark, the expectant crowd murmurs in hushed tones, kids wrestle in the grass and run about. Waiting. Suddenly a great BOOM! and the single Firework arcs up from behind the Curley School. Lights come on in the school's bell tower illuminating the Santa Claus waving his arms. In the old days, Greatbeeper tells me, The Santa used to ride an aerial cable slide from the bell tower to the base of a large tree on the common but one day he started early with the Christmas Spirit. His fall from the slide resulted in a broken head so now he is delivered to the common by the single float with four tiny reindeer. Down from the school comes the float, led by a Follow Me car and followed by the Cheer-Leader section of the Ajo Primary School. The marching band is elsewhere. At the end of the second circuit of the common the float stops to let The Santa off; he wades through a throng of kids to a throne and is immediately set upon by the little'uns who've been standing on queue since sunset. I and the Greatbeeper make a circuit of the proceedings and end up at a Carolling Sing-Along Candle-Lighting Service where we warm up before driving back into the desert. Since the Writers Guild is on strike this part will be a rerun from a previous letter. This Christmas I am in Christchurch reading how Holiday Rationing in McMurdo prompted some folks to propose moving the "day off" to Saturday (the usual work-week there is six nine-hour days) so the community could have a two-day weekend. Christmas especially has been so commercialised that it is hardly worth bothering with in many respects. At least Easter has withstood the machinations of the Calendar Corruptors and still happens when it will. I prefer to my Christmas gifting on Twelfth Night--very much more traditional and usually the shopping is better. I expect in a few years, as established mainstream churches loose more control to the splinter groups and secular majority, we are going to see a movement afoot to change Christmas to a Monday and New Years to the following Friday then business will force everyone to take that week as one of their vacation weeks and most everyone in America will think--What a blessing to get it all over with at once. At McMurdo it was eventually agreed that Christmas should happen on Christmas but New Years for sure would be moved. But what is really interesting as far as the celebration of Christmas is concerned is that there are almost no lights anywhere in any of the communities here. A few do up some street lamp-poles but since the sky is not dark enough to show them off to good effect until 10pm they are seen by only a few people. I don't spend all that much time in residential neighborhoods but when I have there are no lights in evidence. Christmas here is a two and a half day holiday for many folks, they get a half day on the Eve and then the day after Christmas is Boxing Day. (That's where all the kids fight over the presents.) And of course this happens during the six-week summer break for all the schools: Kids in shorts and way overdressed Santas sweating behind their beards. Sunday last I went to the Catholic Cathedral for a performance of Handle's Messiah. The Cathedral of The Blessed Sacrament was blessed and opened in February 1905 and sits somewhat in the southeast corner of downtown Christchurch, several blocks from the Anglican Cathedral which was opened in 1881 and now dominates Cathedral Square in the centre. The organ of the Catholic Cathedral was made by Halmshaw's of Bermingham and dates from 1879. The last time I attended a performance of the Messiah was maybe ten years ago and I am powerless before the emotional onslaught of Unto Us A Child Is Born and the Hallelujah Chorus, especially when the audience is encouraged to participate. Getting all teary makes it difficult to sing and I have it hard enough to carry a tune. As a diversion I studied the cobwebs at the tops of the thirteen columns supporting my side of the gallery above the nave and the pattern of the embossed zinc ceilings. I also noted how the chair in the apse, the Bishop's Chair I later learnt, seemed out of place. The cobwebs were black--it look'd like there'd been a fire. Next morning in the newspaper was a story of the damage done by an arsonist who had torch'd the Bishop's Chair early that Sunday morning. Last night was a Midnight Mass with more choral presentations and the Great Organ Mass by Haydn. Not as emotionally draining as the Messiah but a good homily to think on. In the meantime the rest of the city has been one great commercial war-zone, a morass of car-parks and busy busses as local shoppers compete with tourists for the attention of those whose business it is to make a living selling. This is peak tourist season. To my Christian friends: Merry Christmas; to my Jewish friends: Happy Hanukkah; to my Atheist friends: Good Luck; and to my Agnostic Compatriots: credo quia absurdum. Have a happy Winter, or an early Spring. Or both if you wish.